It is always party time for these social butterflies. These social butterflies are considered to be very pack oriented and gregarious. Whether their pack includes humans or other dogs, they easily become bonded with others. They are not meant to be left alone for long periods of time. They require the companionship of others, animal or human. If left with no others around to occupy him or her, either the howling begins, the escape route is started, or something you really liked is destroyed. For example, a Siberian pup could easily relieve boredom by turning your waterbed into a large pool. As they say, "idle paws are the devil's workshop!" This isn't to say that Siberians can't happily live as "only children." 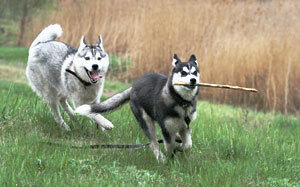 Nor is it to say that Siberians can only live happy lives in homes that have someone home all day. There is always a way, if the Siberian owner is willing. In today's day and age most dogs are left to their own devices while their families are out and hard at work earning biscuit money. During this "free time," the use of a crate is strongly recommended. The word crate is often viewed by many people as being a prison or jail. While it could become that if it isn't properly used, the crate—when utilized properly—can be a happy condo or safe place for a dog. Remember that dogs are denning animals and they look for the close and confined security that a crate can give them. Ever notice a dog without a "crate" often takes to resting under a computer desk, under a table, or behind a couch? Slap a gate on the opening and what do you think it is? Answer: A crate.